Most 21st century classrooms include a plethora of subjects such as mathematics, science, language, social sciences and computer science but now, what’s interesting to witness is the emerging discussion on the skills that will prepare the post-millennials for the world outside. These skills are nothing complex but include things that will be needed everyday such as empathy, courage, big-picture thinking, persistence, self-help and the like. These skills are definitely needed in today’s competitive, collaborative and communicative world. These are the qualities that will help students prepare for real life problem solving. As rightly put by Dov Seidman, a thought leader of principled behaviour, this is the ‘era of behaviour’, how we behave is becoming increasingly important to succeed in today’s hyper-connected world. Let me take you on a journey of a classroom that has been converted into a ‘wonderland’ both for the students and teachers post the introduction of an open source programming platform, Scratch. First, wonderland for kids because every now and then, they can be seen giving an ecstatic shout on seeing the magic unfurl on the screen through their tiny fingers and second, for a teacher, because not only does it provide an open ended environment to work on but also for a 21st century classroom, it inevitably encourages the above mentioned skills such as courage, persistence, empathy, creativity, etc. 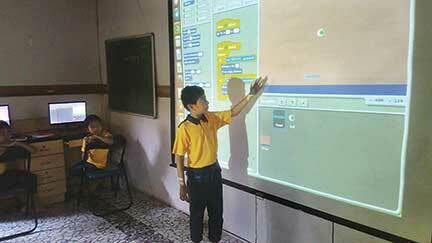 Scratch is a free visual programming tool built by MIT, designed for kids aged 8-16 years. The best part is that it can be used both online as well as offline. It has an intuitive drag and drop interface where students can choose different blocks of instructions to perform various tasks. These tasks range from making a character walk, run, glide, spin, sing, talk, to more complex stuff like changing shapes, sizes, flying and jumping. Using Scratch, students can create stories, animation and games. As soon as the word ‘game’ rings in their ears, you have already caught their attention but let me tell you that though the journey might look interesting, it is not without sweat. Let’s see how. Self-discovery: Be it any subject, today’s classroom demands that children construct their own understanding by independently figuring things out. A guided approach works well for the curious minds to reach its true potential. The focus is more on how to think rather than what to think. As a coding facilitator, a tool like Scratch immensely helps in letting kids do just that. In the class, once a concept is introduced to kids, they are left on their own to figure things out and this is possible because we are working with a technology that gives instant feedback. Let me give you an example, a Scratch screen is juxtaposed on a co-ordinate plane. To make a character move, fly or jump, one needs to figure out the right blocks and the correct fit of x and y values. Students drag the blocks and put values they think are correct and realize soon that something’s amiss. This is what leads to constant discovery. They keep putting the blocks and values back and forth until it all starts working. The beauty is that they find a problem and then find its solution also, at least, most of the time. Perseverance: In a world where everything is instant and fast, it is important that children learn the value of persistence and not give up easily. This way, children will enjoy the journey. While working on projects, they face a lot of frustration and dejection, get bored, sometimes their codes just don’t work, it can be a major problem or a minor issue but because it is their project, they need to keep at it. It’s all about examining each line of the written code. Kids know that in a coding class, giving up is not an option. They try it on their own, discuss and debate with peers and facilitators and gradually find a solution. If we look at the bigger picture though, the main aim of exposing kids to coding is not to make them take up coding as a profession but in case they want to, they know that coding demands discipline. Sharing: Since Scratch is an open source, by working on it we become part of a community, and that too, a global one. The great thing about working on Scratch is that one can easily share projects online. The coolest part is that anyone from the Scratch community can not only view your project but download it, tweak the program and boom! publish it back, called ‘remix the project’ in Scratch lingo. When kids watch projects done by others, they get a peek into their thinking, their realities, their style and most importantly it promotes competencies knowing that there is no limit. Good things are not to be restricted. Creativity: Scratch is a platform that allows kids to turn their imagination into reality and that brings the feeling of wonder in the class. It lets you create and not just consume content and this is both magical and powerful. With an array of blocks, backgrounds, characters (known as Sprite) available to students, we have seen their imagination run wild. It also gives children an option to create their own characters and backgrounds. This means they have their thinking caps on at all times. Taking cue from the games they have played, they try to recreate them and add their own elements which in a way is empowering. Students also get a chance to create their own stories where a shark eats a fish, then magically turns into a whale or there is a polar bear birthday party where a bat comes flying in and a dancer shows off his moon walk – the projects are engaging and sometimes hilarious. While Scratch has an enormous capacity to help kids, there are other resources as well that can be used in the classroom as a great starting point for coding. Some of them are Code.org while Tynker and Codemonkey can be explored for their free challenges. The author facilitates the computer coding course at Tamarind Tree school. Tamarind Tree is an alternative technology driven school for first generation tribal learners, in Dahanu taluka, Maharashtra. She can be reached at nehakulshrestha29@gmail.com.